This quote from Eric Dolphy, which was documented on one of his last recordings in early summer 1964, belongs to the classical repertoire of music commentaries on jazz. A short time earlier, Dolphy – following his famously notorious tour with the Charles Mingus Jazz Workshop ‑ had taken an apartment in Paris. He was planning to marry his fiancée, the dancer Joyce Mordecai, there in July. They had met back in Los Angeles, but she had already chosen a life in exile in Europe as a way to better realise her own art. Now, fifty years after Dolphy’s tragic collapse during an opening concert in a Berlin club, Silke Eberhard, a musician who has chosen to make Berlin her home, recorded the Love Suite with Potsa Lotsa Plus in a studio of Radio Berlin Brandenburg (rbb). The live premiere of the suite took place in Berlin that same year at the jazz festival’s 50th anniversary. This was preceded, however by an evocative discovery and a period of intense preoccupation with Eric Dolphy’s music. 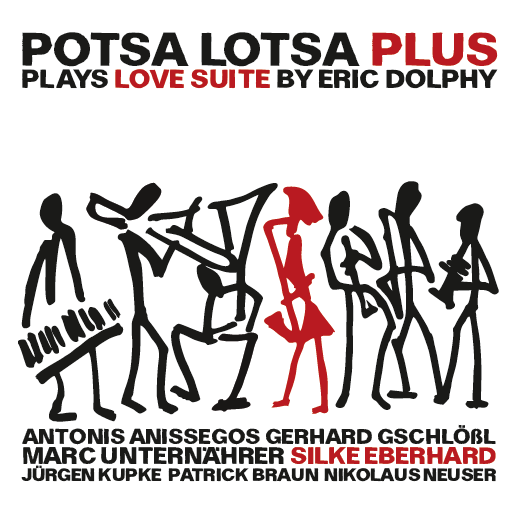 With Potsa Lotsa and Potsa Lotsa Plus, Silke Eberhard has made a substantial and fascinating jazz contribution that now allows the sombre relationship between Berlin and Eric Dolphy to shine under a softer light.